Members of the Hamboard Family entered the Shark Tank riding on a wave of excitement with the wheels of their craft spinning below them. They gave a very lively and energetic presentation, and at the same time spoke professionally demonstrating their knowledge of their company and industry. While the whole family may be involved, the founders of the Hamboard are Pete Hamborg, Gus Hamborg, and Donny Hamborg. Pete is the main inventor, Gus his oldest son, and Donny, an entrepreneur for over 10 years, handles the business side of Hamboards. The trio came seeking $100,000 and in turn was prepared to give up a 15% stake of their company, which gave their company a value slightly less than $700,000 at $667,000. My first impression of the idea was that it would be fun, as we have all at some point dreamed of riding a monster wave, but also that it is a creative idea which, with the right vision, could definitely succeed. Daymond John, and Robert Herjavec expressed similar impressions as they eagerly jumped onto a board to sample the excitement. Although they looked somewhat uncoordinated on the boards, you could tell that they enjoyed the youthful feeling associated with the product. The development of the Hamboard Company comes complete with a great story, which in today’s small business environment can help create the wave of excitement necessary to stay afloat. Pete Hamborg is a fireman in Huntington Beach, California, where his five sons (when not surfing) are employed as lifeguards. He wanted to give his sons a surfboard-like item that they could use during their time off the beach, as well as create a learning tool to teach younger children the motions of surfing safely. Their story began in 1995 and has progressed to the point where sales over the last 12 months have reached $225,000. However, although the company sure has come a long way and design patents exist on all the board models, the under-board hardware is not yet protected by any utility patents. Additionally, there is some competition. These factors made it a bit difficult for some Sharks to go in. Lori Greiner was the first Shark to take a bite out of the Hamborg’s hopes of securing a deal, as she stated her opinion saying that it was more of a niche market and was oriented to sell only near coastal areas. Right behind her was Mark Cuban. 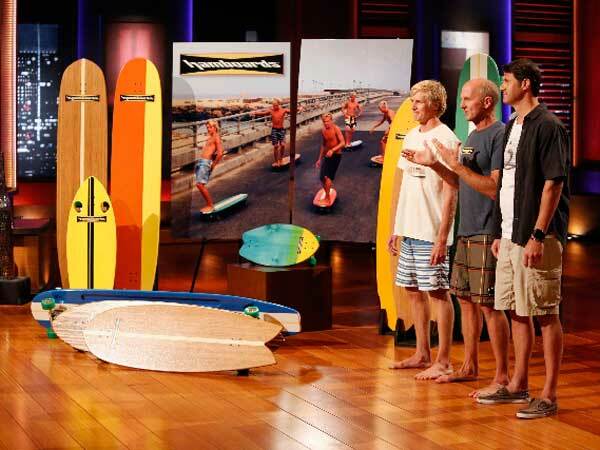 Mark liked the idea of the paddle as an accessory to create a similar experience to his recent Tower Paddleboard success, but ultimately felt that the marketing plan of creating a surf-culture mentality would not resonate with non-surfers. Kevin was next to drop out as he couldn't see the vision necessary to crack into the current skateboard market which already consists of key players. Even with some doubt in the Tank, Daymond expressed interest in the Hamboard business and offered $100,000 for 30% of the company, in hopes of securing a licensing deal. Robert, who saw the vision as “selling the California dream baby”, offered $300,000 for 33% of the company. The Hamborgs made an immediate counter-offer of $300,000 for 30%, and Robert accepted as he made his way over to the carpet to hang-ten with these modern-era beach boys. Overall Performance: Presentation: 46/50. Strategy: 23/25. Product: 20/25.